It was the Australasian Performing Right Association (APRA) Awards, 2001. Glenn Shorrock and Graeham Goble, who had shared many a stage together as founding members of the Little River Band, hadn't seen each other in more than 10 years. And yet, there they were, sharing a table. A conversation ensued, which must have been tentative at first, because their last parting had not been an easy one. Still, it was a start. As they talked, a renewed respect for each other began to emerge. They realized that their musical heritage, and legacy, would forever be entwined with each other. That what they had accomplished together was far greater than the sum of what each man could do alone. They began to wonder... could it happen again? There was a third man, without whom it could not be done. Beeb Birtles was half a world away, in his home near Nashville, when the phone rang out of the blue. On the line was Graeham Goble, who could hardly contain his excitement at the very thought of it all. The three of them together, would it work? Beeb had never given the idea of a reunion a second thought in the past, but when the call came, he was immediately enthused. In March 2002, the three ignited their magical vocal blend for the first time in nearly 20 years. They have, indeed come Full Circle, and invite you to join them on this next part of their amazing journey. It was a chilly day in London, 1974. Beeb Birtles, Glenn Shorrock and Graeham Goble brought their voices together for the first time, and almost instantly, they knew it was magic. Each had made a major impact on Australian music in his own right, but now, together, there was something more. They agreed to meet again when each returned to Australia the following year. 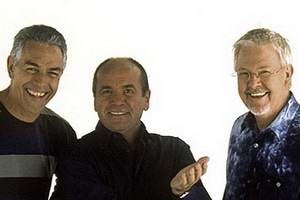 As founding members of Little River Band, Birtles, Shorrock and Goble paved the way for international success and recognition of Australian music. From 1977 to 1983, they scored such hits as 'Help Is On Its Way', 'Happy Anniversary', 'Reminiscing', 'Lady', 'Cool Change', and 'Take it Easy on Me', among others. Their international success was unprecedented at the time and remains a gold standard for Australian musicians today. Over time, each left Little River Band to pursue other personal and professional goals. Now, they are together again reclaiming their heritage and drawing renewed energy from longtime fans and new fans alike. "I believe in getting into hot water; it keeps you clean."